Click HERE for complete details or to order today at special CurtPalme.com reduced prices! I finally had a chance to hook up my 2 new Radiance XS's into my blend set up and removed the 2 HDQ's. First impression , NICE!! Much better image than the HDQ's. Probably because i am able to output YCbCr 422 directly to my TV-One C2-2250A blend Units. Even with out using the full CMS yet to nail each PJ's color Gamut and Greyscale/Gamma curves the blend zone is as good as I had it using the CMS in the HDQ's. I think the D-RGB outputs of the HDQ did not do a great job of converting the YCbCr to D-RGB and caused some uniformity problems. but so far I love these Radiance's!!! Once they add the ability to make HDMI output 2 independent of any adjustments made to input one I'll be able to daisy chain the units and use one as the source switcher!! Hopefully they will be adding a blend feature and my Tv-ones will be up for sale ! Keep up the great work Jim and company!! PS, I'll post again once I get to use Calman v4 full interactive calibration with the XS's. Nice write-up Nash. The Calman 4 interaction is the piece I'm looking for. I really like that I'll be able to manipulate the marquee software and the Radiance from the same computer. Looking forward to seeing what you think of it. Did you get the XS+, or did you stick with the standard XS since your running a blend and a 2.35 ratio? I just got the Standard XS's since my TV-ones can output up to 72hz with 1080p as well. I do not use that though. it always looked great! But this is like putting in anew set of contact lenses after having the same set in for over a month. Like a slight film was removed. I can only imagine what it would look like if I had one less box removed(Tv-Ones). Hopefully this week I'll try to get to the Calibration with Calman v4. Today i am going to try to go from the lumagen directly to the Moome internal card to see if that is the link in the chain causing the YCbCr issue. Right now I have YCbCr all the way to the Tv-one input but have to go Digital RGBHV to the Moome. If i set the Tv-One to out put YUV(YCbCr) out i get the weird colors of purple and green. And there is no way on my Version of the Moome card to force it to accept YCbCr 422, although the Tv-Ones conversion is really really good combined with the Lumagen XS. I am trying to contact Moome to upgrade my card to be able to force this color space if that is what my problem is but no response yet. But i think its more of the Tv-One not working correctly with the Moome card. it has a EDID grab function where it can grad the EDID from the source and the monitor and store them in a preset and you then use that preset, but that did not work. So I have some experimenting to do with removing components in the chain to see what happens. But this is a Radiance thread and so far I like it a lot! bypassing the C2-2250's I sent a tech question to TV-One now. wow, you guys are pulling out the stops! Any make video processor, or is this for Lumagen VPs only? I have a DVDO ISCAN Pro, which clearly is not worth $500, which makes this deal all the more intriquing. It's for any working video processor. Doesn't have to be a Lumagen. If it's a Lumagen video processor it doesn't even have to be working! Got a line doubler from 1995 gathering dust that you can't even sell for $50? It's now worth $500 towards a Radiance! This is in addition to our CurtPalme.com discounted prices on the Radiance XS and XE. This means that (for example) the $3495 Radiance XS which is normally discounted here for only $2475 can now be had for only $1975 if you have an old unit gathering dust! That's $1520 off! If you don't have a trade-in you can get a free high-end HDMI extender (US/Canada only)! Our intent is to constantly cause intrigue. So $2k for the XS - how does that compare to the iScan Duo? I know the Radiance has more features but are they actually stuff I would use with a basic setup? Can either of these output custom resolutions such as 900p or do I need an HTPC for that? I am using an HDFury3 right now. HDFury3 -> BG-808s + HD-145 lenses. The Radiance will do what ever you want, its that good!!! Total custom res and if you get the XS+ model you can go up to 72 hz if needed. having seen both side by side, the Radiance does a much better job with it's processing. Price reflects that, obviously, so it's all in how much you want to pay. Cool! Too bad it doesn't output analog like the Lumagen Vision HDP PRO. Outputting HDMI, I'm worried about how the Fury will handle non-standard res. Working with Calman and the Radiance is pretty awesome. Just put the graph where you want it, and Calman does the rest with the Radiance. THe Duo is no different in that regard. WHen using Calman, you wouldn't know the difference which one your adjusting. They did a nice job with the interactive interface. No luck yet. I think its me. Calman is in interactive mode but I think the Radiance is not making changes. I have to check the firmware. I am actually warming up my Left Marquee right now to try again. Can CalMAN 3.7 (standard) control any of these devices? I realize it's probably not integrated as nicely as v4. It will only control the Test Patterns. Cv4 does the interactive. I am updating to the latest firmware now. So We'll see if that was my problem. I had the march version before. Not if you know but I have a CRT Blend set up. So when doing this test I only have one PJ on while i measure the other one. Both radiance's are stacked in the rack on top of each other. I connected the Null Modem cable to the wrong unit!!!!! When pressing the remote it would control both units together so i was seeing the remote work, the menu's come up but the cable was connected tot he unit i was not viewing on screen!! Arrgggg I am a total idiot!!!! Ok back to your normal programing. WE'RE NOW SHIPPING "3D READY" UNITS! PURCHASE A RADIANCE NOW AND UPGRADE TO 3D FOR FREE ONCE THE SOFTWARE IS RELEASED! The Radiance gets a name change! It's now called the "Radiance 3D". The new Radiance 3D with HDMI 1.4 actually processes the 3D, and does not just pass through 3D like other scalers such as the DVDO Duo. The Radiance can scale, crop and calibrate your 3D sources (Blu-ray/PS3 for now, with the other modes following in the production release). All included in one price! Who's interested in a lower priced Radiance Video Processor with all the same features? 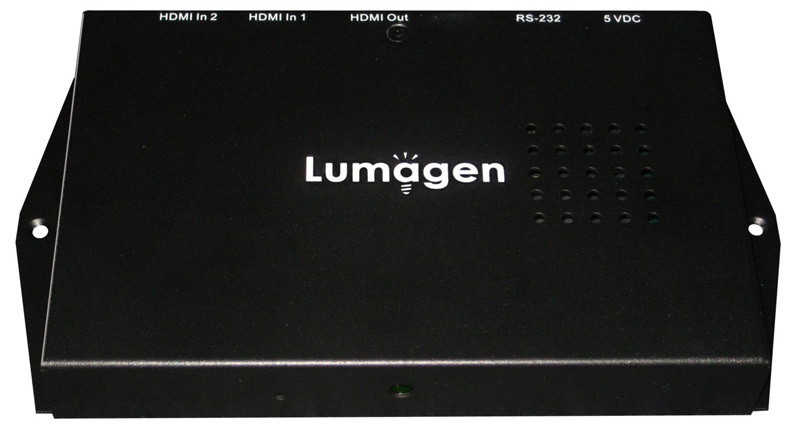 Jim and his team at Lumagen have come up with an even lower priced Radiance video processor that still keeps all the same features as the bigger units but simply reduces the number of connections to two HDMI 1.4 inputs and one HDMI 1.4 output. Perfect for today's home theaters where you route everything through a receiver or pre-amp anyway! The RadianceMini 3D includes all the same feature and functions as the bigger units and is considerably smaller with mounting tabs so it can be fastened to a shelf, or to the wall behind a flat-panel display. The Radiance 3D is the only video processor that we know of that, over the years, and kept up with new features and offered upgrades to existing users - often through completely free software upgrades! Most other companies we know of do not do this. Instead, they make you buy a new model as new features are introduced. You don't hear this often but CurtPalme.com is comfortable in saying that the Radiance is the one true "buy once, use forever" video processor that has stood the test of time. The Radiance was completely over engineered with processing power that have proven that it can take on just about anything. Truly phenomenal support from Jim Peterson and his crew! RadianceMini 3D joins the award winning Lumagen® Radiance™ video processor family. January 6, 2011 — Lumagen®, Inc., a specialist in the design and manufacture of video products for the home and corporate markets, is announcing the RadianceMini 3D. The RadianceMini 3D joins other members of the Radiance family, which includes the CEA® 2010 Platinum Video Product of the Year, the RadianceXE. The RadianceMini 3D sports two HDMI® inputs, and one HDMI output, and can be controlled by either the included IR remote, or by RS-232. Control and setup are the same as other units in the Radiance family. In addition, it provides the same exceptional video quality that the Radiance line has become known for. The unit’s case measures in at a diminutive 8.5” by 5” by 1.05” (216mm by 127mm by 27mm) and has mounting tabs so it can be fastened to a shelf, or to the wall behind a flat-panel display. HDMI 1.4 3D is supported, including scaling and aspect ratio control for 3D Bluray movies for use with an anamorphic lens, such as those produced by Panamorph®. For dual-projector 3D, two units can be used with each receiving 3D and outputting video for either the left-eye or right-eye. As with the other members of the Radiance line, proprietary No-ring™ scaling, linear-Gamma RGB-color-palette CMS, 21-point parametric grayscale calibration, video deinterlacing, MPEG artifact reduction, temporal noise reduction, and other features, combine to provide the best video quality available. The RadianceMini 3D is currently available, and is priced at $1995 MSRP. So the mini doesn't do 72hz correct?